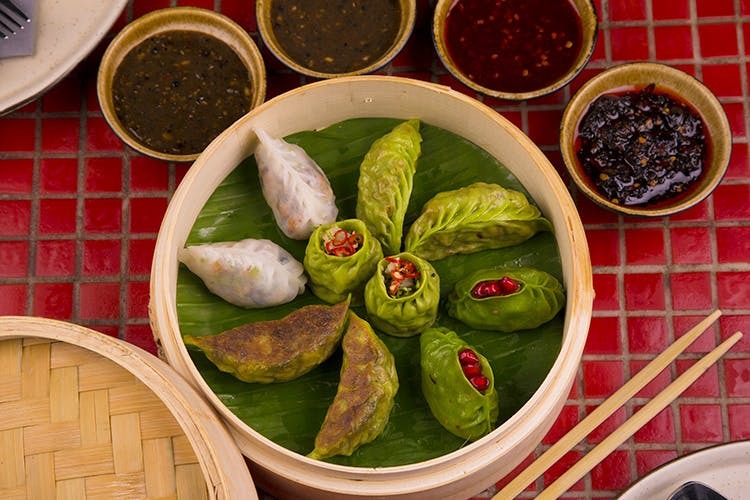 Everyone’s fave Pan-Asian Restaurant Mamagoto has a platter festival going on for yummy dumplings and maki to share with the gang at an affordable price! Drop by Mamagoto on KNK road, pick up your chopsticks (or try to) and take delicious quick bites off their platters. There’s a Super Platter Festival going on and you probably want to know what it offers. Well, we gave it a shot and here’s what we thought. Spicy Mama’s Kiwi is deliciously refreshing with a nick kick of green chilli flakes. There’s also the Watermelon Breeze with fresh coconut water, raspberries, and watermelon – a powerful combo to re-energise before you start your meal! And it costs about INR 179. Comfort Asian food when it rains outside – is there anything more perfect? The ambience at Mamagato is colourfully quirky and fun and we were glad to be indoors and tuck into the specials. We started off with the Aunty’s Platter which had Chicken Spring Rolls, Chicken Satay, Basil Chicken Cups and Chicken Gyoza priced at INR 699. The vegetarian version consists of Corn Fritters, Tofu Satay, Veg Gyoza and Hua Hin Highway Rolls at INR 599. We love that the platters are delish and affordable. Just one thing, don’t forget dessert – we fell in love with the warm, melt-in-your-mouth Chunky Caramel Sponge Cake With Toffee Sauce & ice cream. Give it a go and thank us later!